Dr. Rakesh Bhattacharya and Dr. Lauren Bhattacharya are federally certified DOT Medical Examiners who are always on-site. 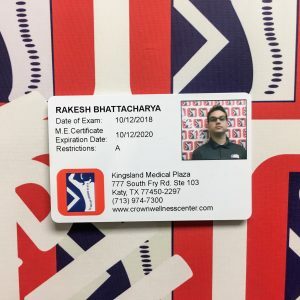 We are the only providers in the Houston metroplex that provide our drivers with plastic, wallet sized DOT medical examiner's certificate IDs! Below are a few suggestions on how you can get all of your employees designated to supervise CDL drivers trained. Do you have a CDL and operate an interstate or/and intrastate business on public roads? If yes, are you in a DOT Drug and Alcohol Program? If no then this chart does not pertain to you. Are you in a DOT Drug and Alcohol Program? If yes, are you an owner-operator? If yes, if you are an owner-operator and you have already enrolled in a DOT Drug and Alcohol Program then you do not need the DOT Supervisor Training. If no, are you a supervisor? If yes, have you ever taken the DOT Supervisor Training at your current job? If no, if you are not a supervisor, then you do not need the DOT Supervisor Training. Have you ever taken the DOT Supervisor Training at your current job? If yes, you are not required to take the DOT Supervisor Training. However, if the trained supervisor leaves the company then the new supervisor must get the required DOT Supervisor Training. Crown Wellness Center in partnership with TeamCME can provide owner-operators with a consortium to meet FMCSA requirements and be in compliance. Crown Wellness Center does drug testing with hair samples. Call us as soon as possible! We can point you in the right direction and get you back into compliance. Do NOT blow it off and do nothing! Who must have a DOT Physical Examination?